When it comes to improving the community around us, many people think of traditional community planning tools and services. What is less often considered, and yet a rising trend in community development initiatives, is the use of design thinking for community advancement. In the past, design has been viewed as a skill used to primarily enhance the visual and aesthetic quality of a new innovation or place, and while it does still play that role, it can also create real and tangible improvements in communities, such as improvements to the way certain groups are able to live and work in a society, improvements to social issues like poverty, and a host of other important community factors. It adds a more human element to traditional community planning, through the use of both traditional and less traditional methods of reaching a conclusion for the community. One of the reasons design thinking works so well is that it is done in partnership with others in the community. While in the past, design choices were based only on decisions made by a team of designers, design thinking incorporates working closely with customers, consumers, and the community to figure out innovative design elements that can be used to create a positive impact on the environment. An example of design thinking making a positive impact on the community can be found at The Center for Collaborative Healthcare and Design. We recently spoke with Kim Erwin, Founder and Director of the Center for Collaborative Healthcare Design, and Assistant Professor at the Institute of Technology, or IIT, Chicago to find out how design thinking in the healthcare industry can assess where physicians and hospitals are falling short, and how this information can be used to develop prototypes and methods to meet those needs efficiently. An important problem that The Center for Collaborative Healthcare Design currently strives to address is clinician burnout. According to Erwin, design thinking is able to bring two different approaches to this problem. The first approach is an understanding that design inherently has a value bias, and functions by the rule that everyone counts. This means that design often advocates for people, as opposed to systems. The second approach to design thinking is creating system aware solutions. According to Erwin, this approach means, “taking one piece of it, and looking up and down the activity system… and saying ‘Can we design this particular intervention to be system aware’”. Creating system aware solutions does not attempt to solve the entire problem, but instead looks to create an intentional intervention and make progress. 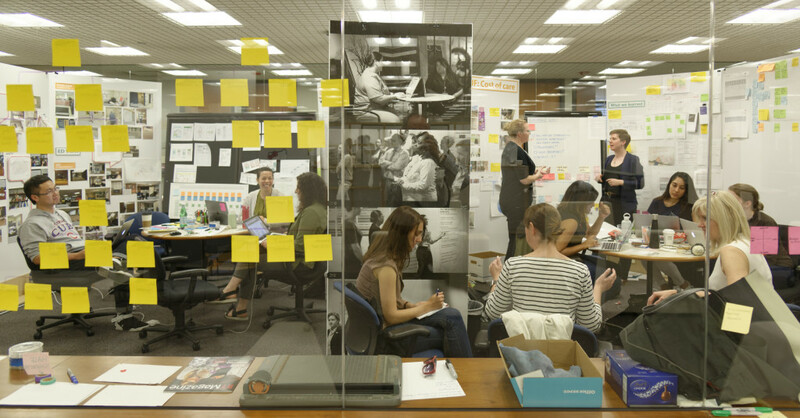 Is design thinking only for designers? While the best case scenario for implementing design thinking is to work with designers, there are more and more organizations that are approaching projects with design thinking that do not have a design background. According to Erwin, everyone is able to learn the principles and value system of design, but not everyone is capable of assessing which methods are the right approach for a particular project. Changing the way we approach who to staff our projects with could be a step in the direction of creating real change through design thinking. Are you interested in a design approach for your community? Are you interested in how the design approach to community improvement could be used in your nonprofit or community group? Do you have a social issue you’re trying to solve that could benefit from a team of designers and strategic thinkers helping you brainstorm and facilitate new processes and products? Here at Panorama Innovation we help companies create innovative products and services through a deeper understanding of people and the future. Our team is experienced at transforming real life needs, desires and motivations to guide the design process and create meaningful solutions.We bring expertise in anthropology, experience design, business strategy, organizational change, ideation, prototyping and concept testing. We have worked across a broad range of industries including technology, architecture, office furniture manufacturing, healthcare, consumer packaged goods, financial services, retail and the nonprofit sector. If you would like to know how we can help you reach your goals please get in touch with us. We’d be happy to discuss your project and let you know how we can help!